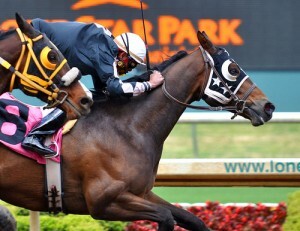 Social media, search optimization and purchase support, form a content marketing trifecta, a term originating in horse racing. To finish in the money with content marketing, use these three elements in tandem to maximize sales while improving ROI. Before placing your content marketing bets (aka developing your editorial calendar), here’s what’s needed from each leg of this triumvirate. Purchase process — Where you start thinking about your content marketing. Specifically what information do you need at every step of the buying process including: awareness, engagement, purchase, post purchase support (including returns) and advocacy. At the same time, consider who the target for your content is (if it’s not the buyer), what format do they want to receive it in. and where are they looking for your information (think device and physical location). Provide product information in a variety of formats. Offer content marketing that shows off your products and answers customers’ questions in a variety of formats without knocking them over the head with your promotions. Don’t forget to educate them about your firm as well since people buy from people. Create memorable stories. Make your products the hero of your content marketing. Use stories to extend the brand and personality of your products. Make your brand come to life. Since brands are more than just a logo, utilize your content market to provide a 360 degree view of your brand through videos, photographs and images. Give it a voice not only through the language used but also the sound of its voice. 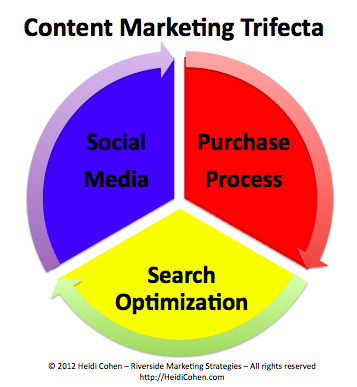 Search optimization (SEO) — make your content findable at each step of the sales process. Embrace keyword use. Focus each article, post or tweet on a keyword phrase. Integrate other long-tail keyword terms into your content where appropriate. The context of these terms is critical but don’t overuse your keyword terms in any one article or page. Structure your content to enhance optimization. Use the keyword phrase in your titles and URLs (please, no computer generated URLs). Where appropriate, consider using a blog that’s integrated into your website (or in lieu of a website) since the underlying structure is search friendly. Also, provide keyword-rich text to define non-text information like photographs and videos. Incorporate links into content where appropriate. Link to related information on your site (target specific product if possible) If you’re linking to product, try to minimize the number of steps between the product and purchase. Also, link to information on third party sites. When creating links, place them on meaningful words, not “click here” to aid contextual meaning. Social Media — It’s fueled by and distributes content marketing. Show that your content is sharable. Use easy-to-find social sharing buttons to extend your content marketing’s reach. Encourage sharing by the use of a call-to-action. Streamline the process by making the sharing buttons easy to find and not requiring a login. Encourage all forms of engagement. Think reading, sharing and contributing to the conversation. Remember on social media platforms, people’s first goal is socializing with family and friends. Therefore, create content they want to read or view. Ask for their opinions in the form of comments, likes, shares, and reviews. As a marketer, this means you need to be willing and available to respond to prospects, customers and the public on the social media platforms they frequent. Respond to prospects and customers. It’s content plus conversation that makes a difference on social media. This means engaging in dialogue on platforms like Facebook and Twitter as well as answering comments on blogs. To maximize the impact of your content marketing in terms of sales and ROI, integrate the combination of purchase process, search optimization and social media into the creation and distribution of your organization’s information. Don’t overlook the importance of a contextually relevant call-to-action for sales, a promotional code for tracking results back to your content marketing and a streamlined conversion process. What else would you add to improve your content marketing’s race to sales? Tags purchase process, search optimization, SEO, Social Media. Bookmark the permalink. Good insights. The whole process is done during optimization to make a site more search engine friendly? The search engine marketing process is multifaceted, and not easily pinned down to one or two steps. Because of this, optimization is often viewed as a vague, almost nebulous process, but its many aspects are actually well-defined. Optimization is something that involves the entire website: its design, marketing strategy, copy, structure and popularity.